05. If Only I Was A Girl (and had a boy like me) (3:40) 8/?? 06. You Missed You Fell (1:51) 8/?? during the identity searchings of Billy Angel, Victor Ethos, and yers trooley. Thanx to Johna, Harry, and Dave Shipley. Portions of NTH recorded at Linden 1974. The voice of Janelle Ferguson is heard on B7. A5 (Moore/Burroughs), A7 (Palmer), A10 (Lovera). 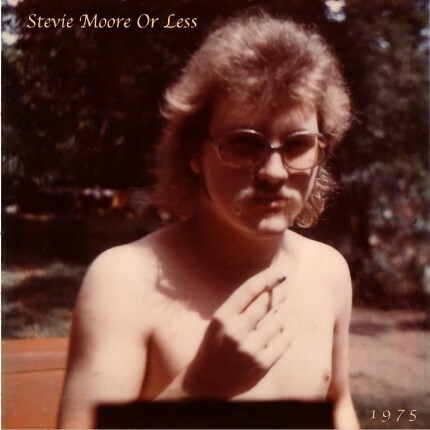 AMG REVIEW: 1975's Stevie Moore Or Less builds on the strengths of the previous year's Stevie Moore Often, adding that album's newfound pop sensibility to the experimental tendencies of his earlier work. Both in its original cassette configuration and its expanded two-CD digital upgrade, the album actually consists of two separate but related offerings, including Steviestorys, an album of what Moore terms "narrative songs." These include the wondrously odd "Welcome To London," a hilarious two-person dialogue (with Moore playing both himself and an aggrieved Englishman) interrupted by the rocking instrumental "Baking It," and a lengthy suite-like cycle highlighted by the spoken-word surrealism of "Story" and a pair of great stand-alone pieces of hard-candy pop. "Am I Gonna Cry" and "I Told You." The other disc is even better, a song cycle that's start-to-finish excellent, with some of Moore's best writing ever: the ghostly ballad "I've Begun To Fall In Love" is a Brian Wilson-inspired treasure, and it's immediately followed by the British Invasion-styled "You and Me," one of Moore's finest and sweetest rockers. Other highlights include "Midsummer Reflection" (a samba co-written by Moore and Mike Burroughs in 1968 and originally recorded by their high school band the Marlborough), the comic freakout "Watch Me on the News" and the epic "Because We're the Dig," a hard-rocking tune written by Moore's close friend Victor Lovera that finally puts Moore's mid-'70s predilection for lengthy guitar solos into its proper context. The capper, however, is the simply perfect "Hobbies Galore," easily one of Moore's masterpieces. A simple voice and acoustic guitar tune with a metronome-like tapping for its only percussion and a reverbed whistling solo its only accompaniment, "Hobbies Galore" has one of Moore's most beautiful choruses and a lyric that's clearly close to Moore's heart, so much so that he resurrected the song for 1987's Teenage Spectacular and even named his 2003 greatest hits compilation after it. The CD version of Stevie Moore Or Less includes 1975's Nth, a collection of lengthy, jam-like instrumentals rather like the things the Bevis Frond would be doing a decade or so later, with the Frank Zappa tribute "Legend of the Lege" the standout.